How to Check your Aadhaar Bank Account Linking Status? Home » Personal Finance » How to Check your Aadhaar Bank Account Linking Status? You must be aware that linking Aadhaar to the bank account is mandatory. Failing to which your bank account might be converted inoperable. The deadline of Linking Aadhaar with a bank account is 31st Dec 2017. Apart from this, it is now mandatory to link your Aadhaar card with PAN card, Mutual Fund Folios, Mobile number and many other things. In order to comply with this requirement, banks are asking their customer to submit Aadhaar for linking with a bank account. It is kind of re-KYC. The entire purpose of this exercise is to verify user details and enable tracking of financial transactions. However, it may so happen that although you submitted Aadhaar Details at bank linking of Aadhaar with bank account might not be completed as details are misplaced by bank officials. In order to make sure that your Aadhaar and Bank account linking is successfully done UIDIA has launch new facility. This facility allows you to check your Aadhaar and Bank Account Linking Status. How to Check your Aadhaar and Bank Account Linking Status? Here is step by step guide to know whether your Aadhaar has been linked with your bank account or not. 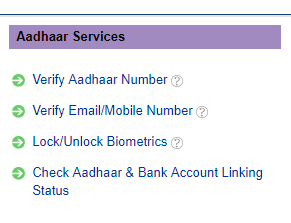 # Step 2 – Under Aadhaar Services section you will find ‘Check Aadhaar & Bank Account Linking Status’ link. Upon clicking that link you will be redirected to another page where you will be prompted with Aadhaar Number and Security Code. # Step 3 – Enter your Aadhaar Number and Security Code. On submission, OTP will be generated and sent to your registered mobile number. # Step 4 – Enter OTP and click on ‘Login’ button. # Step 5 – On successful login, the website displays whether your Aadhaar number is linked to a bank account or not. It will also display name of the bank. If you don’t have internet access you can use your mobile to check Aadhaar linking with a bank account. You need to dial *99*99*1# from your mobile. After that, you need to enter your 12 digit Aadhaar number and provide confirmation. On confirmation, it will show your bank account is linked with Aadhaar card or not. Currently it will display last bank account that is linked with your Aaddhar Number. In case of multiple bank account you need to rely on information given by the bank for the linking of Aadhaar. This service cannot be used if your mobile number is not linked with Aadaar. I hope the information given above will help you to check your Aadaar Linking status with a bank account. Please leave your views and queries in the comment section. How to unlink Aadhaar from Bank Account, Digital Wallet & Mobile? How to Link Aadhaar With LIC Policies Online? Dear Raviraj – do we need to link all our bank accounts to Aadhaar, or only one is good enough. You need to link all your bank accounts with Aadhaar. One is not enough.